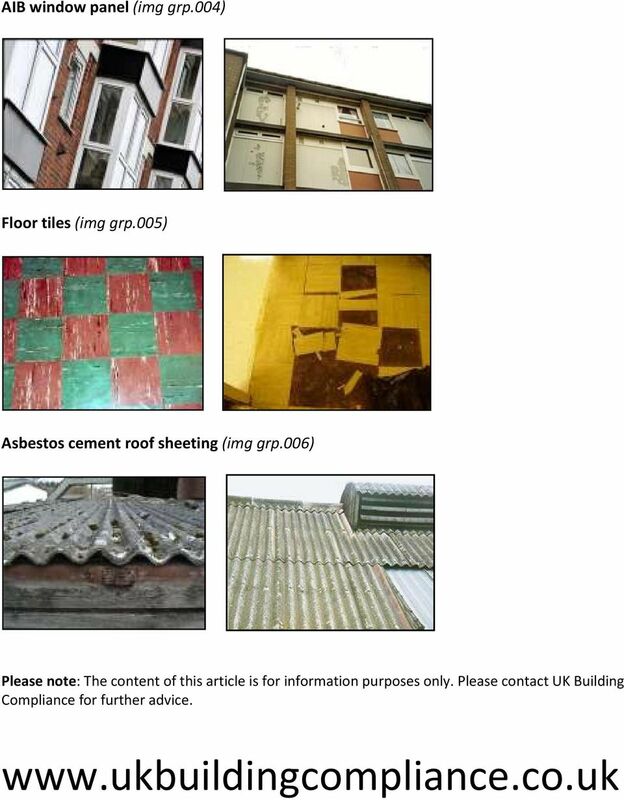 Download "Asbestos is found in many products used in buildings, including ceiling tiles, pipe insulation, boilers and sprayed coatings." 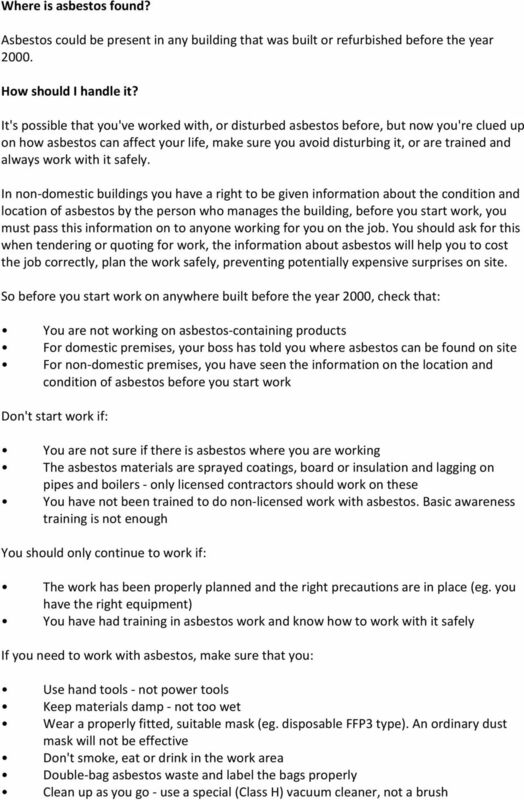 1 A Guide to Asbestos What is Asbestos? Asbestos is a naturally occurring fibrous material that has been a popular building material since the 1950s. It is used as an insulator (to keep in heat and keep out cold), has good fire protection properties and protects against corrosion. Because asbestos is often mixed with another material, it's hard to know if you're working with it or not. But, if you work in a building built before the year 2000, it's likely that some parts of the building will contain asbestos. Asbestos is found in many products used in buildings, including ceiling tiles, pipe insulation, boilers and sprayed coatings. 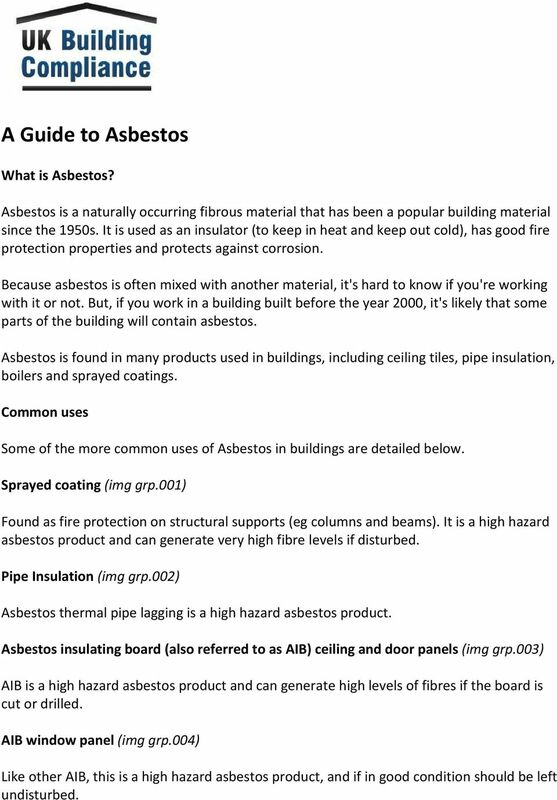 Common uses Some of the more common uses of Asbestos in buildings are detailed below. Sprayed coating (img grp.001) Found as fire protection on structural supports (eg columns and beams). It is a high hazard asbestos product and can generate very high fibre levels if disturbed. Pipe Insulation (img grp.002) Asbestos thermal pipe lagging is a high hazard asbestos product. 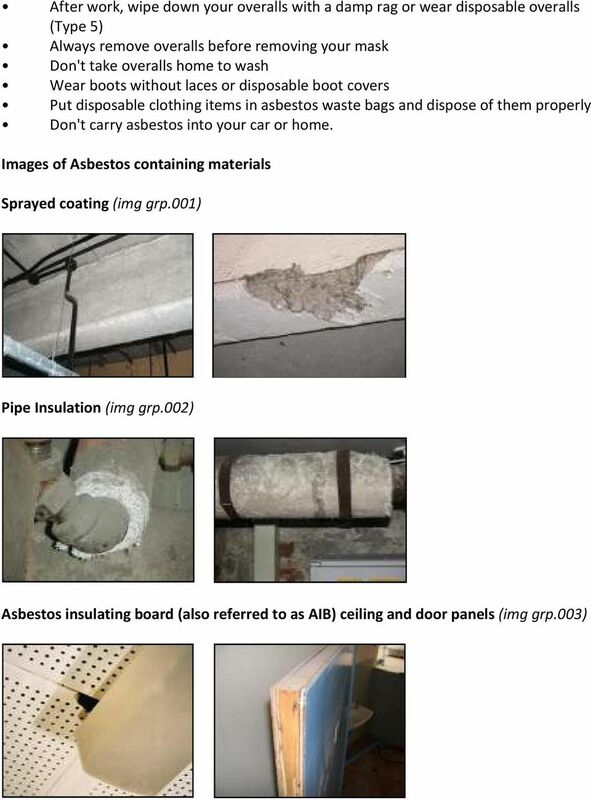 Asbestos insulating board (also referred to as AIB) ceiling and door panels (img grp.003) AIB is a high hazard asbestos product and can generate high levels of fibres if the board is cut or drilled. AIB window panel (img grp.004) Like other AIB, this is a high hazard asbestos product, and if in good condition should be left undisturbed. 2 Floor tiles (img grp.005) Vinyl (PVC) or thermoplastic tiles contain asbestos. Asbestos cement roof sheeting (img grp.006) Asbestos cement sheeting is often found on industrial building roofs and walls. Textured decorative coating (such as Artex) (img grp.007) Textured coatings contain a small amount of asbestos. The asbestos is well bonded and fibres are not easily released. However, it is still an asbestos product, and as such, needs to be worked with safely. What is the danger? 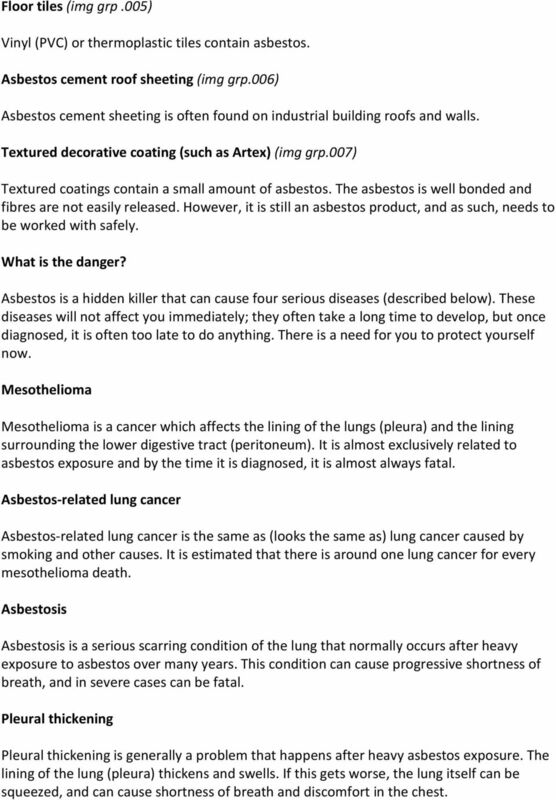 Asbestos is a hidden killer that can cause four serious diseases (described below). These diseases will not affect you immediately; they often take a long time to develop, but once diagnosed, it is often too late to do anything. There is a need for you to protect yourself now. Mesothelioma Mesothelioma is a cancer which affects the lining of the lungs (pleura) and the lining surrounding the lower digestive tract (peritoneum). It is almost exclusively related to asbestos exposure and by the time it is diagnosed, it is almost always fatal. Asbestos-related lung cancer Asbestos-related lung cancer is the same as (looks the same as) lung cancer caused by smoking and other causes. It is estimated that there is around one lung cancer for every mesothelioma death. Asbestosis Asbestosis is a serious scarring condition of the lung that normally occurs after heavy exposure to asbestos over many years. This condition can cause progressive shortness of breath, and in severe cases can be fatal. Pleural thickening Pleural thickening is generally a problem that happens after heavy asbestos exposure. The lining of the lung (pleura) thickens and swells. If this gets worse, the lung itself can be squeezed, and can cause shortness of breath and discomfort in the chest. 5 AIB window panel (img grp.004) Floor tiles (img grp.005) Asbestos cement roof sheeting (img grp.006) Please note: The content of this article is for information purposes only. Please contact UK Building Compliance for further advice.